Tag line: "You've never met anyone like him!" That's the one feeling I cannot shake whenever I watch Carol Reed's classic 1949 thriller, The Third Man. Played wonderfully by Joseph Cotten, Holly Martins is a lost soul, a man alone in a foreign country with nowhere to turn for help. Yet, despite his situation, Holly always tries his damnedest to do the right thing. Unfortunately, the 'right thing' usually blows up in his face. It's just after WWII, and Martins has traveled to war-torn Vienna to meet with his old college friend, Harry Lime, who has written to Holly saying he might have a job waiting for him. But Holly's excitement at the prospect of finding employment quickly turns to sorrow when he learns that Lime was killed in a traffic accident several days earlier, and has only now been taken to the cemetery for burial. 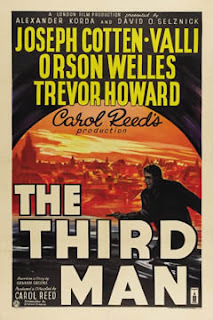 The Third Man is an elusive thriller; the various characters Holly comes across during his investigation spend much of their time cowering in dark shadows, and the truth he so desperately hopes to find only stubbornly reveals itself, usually in very small doses. Holly Martins is our guide through The Third Man, even if his chances of figuring out what's going on aren't particularly good. Like Holly, we the audience must sift through copious amounts of misinformation to uncover even the slightest glimmer of truth. Holly does eventually learn enough to cast some doubt on the integrity of his friend, Harry Lime, and as a result turns his attention away from salvaging Harry's good name in order to help Anna, who has run into some trouble of her own with the Russian wing of the International Police. Even here, Holly can't catch a break; after putting his reputation on the line to protect Anna, she girl can't even bring herself to remember his name (she is constantly calling him “Harry”). Yet through it all, Holly Martins can at least take comfort in the fact that he remained an honest man, an island of truth and innocence adrift in the sea of deceit that was post-war Vienna. Yes, Holly Martins always did what was right, even after he realized doing so would never work to his advantage. Poor Holly. He was living proof that nice guys do, indeed, finish last. Well, at least that's how it was in Vienna. I love this movie, in no small part because of the tremendous script penned by Graham Greene, one of my favorite authors. Welles is this good in other films, but never better. @Steve: Absolutely! The script is tremendous. And Welles shines in his brief role: as great as the film was before he arrives on-screen, it actually gets BETTER once his character is back in the picture. The scene between him and Cotten at the old amusement park is one of the finest ever committed to film (IMHO, anyway). Welles' arrival late in the story is one of the finest "entrances" any actor has ever had in film. I'm trying to think of comparable scenes from other movies, but am hard pressed to come up with any which are as memorable. Klaus: Very true! If there's a list out there of the five greatest character intro scenes, Welles' in THE THIRD MAN has to be on it. And you're right...I can't think of any other entrances that come close. One of my all-time favorite films. I just caught it again on Turner Classic Movies last weekend. I'll say it to anyone who will listen: Yes, there are countless great things about The Third Man -- the post-war Vienna setting, Carol Reed's direction, Graham Greene's tremendous script, Anton Karas' zither score, Orson Welles' legendary entrance, the cat-and-mouse climax in the sewers -- but it's a crime that Trevor Howard was not nominated for a Best Supporting Actor Oscar for his role as Major Calloway. Howard has most of the best lines in the film, as evidenced by your tweet that brought me here ("You were born to be murdered"). And his interactions with (and intolerance of) Holly always makes me smirk, smile, or laugh outright.